Bright-Eyes & Bushy-Tales: We Have A Date! When Justin & I got engaged, I actually did not want to plan for a while. I wanted to spend some time just enjoying being engaged before the craziness of wedding planning began. The good thing is, we were in Hawaii, enjoying each other, without a wedding magazine in site. One detail I did want to set in stone pretty quickly after we got back was the date. I mean, really, you can't even sign up for theknot.com without entering in "the date." I had to make a fake date at first just so I could pull the trigger on that. Figuring out the date was more complicated that I think either of us expected it to be. I've always wanted to have a fall wedding, because I LOVE the fall. Cooler temps, the beautiful colors, fall fashion, chili, football. I mean, really, I could go on and on. A while back, Justin mentioned to me that there would be no fall wedding, because he didn't want to miss a Saturday of Notre Dame football. For a minute, I thought he was serious (I think he kind of was), so I promptly informed him that I had always wanted a fall wedding, so sorry charlie. I actually did stumble upon a message board online with some guys going back and forth discussing how rude it was for people to plan weddings on football Saturdays. While I think to call it "rude" is going a little far, If you haven't guessed, I kind of get it. Hey, my philosophy is two-fold: 1) the quickest way to a man's heart is through his stomach, and 2) the quickest way out of a man's heart is to interfere with his sports. Capiche? We knew we wanted either September or October 2012. We also knew that we were not going to go the Friday or Sunday route. While going that route would have assured some cheaper prices (more bang for your buck! ), we think these days are just too hard for people who work during the week, like us. So, honestly, the first thing I did was look up the 2012 Notre Dame football schedule, since a bunch of Justin's family & friends are huge ND fans. I also took a look at the Michigan football schedule, since the rest are Michigan fans (you're welcome, Dusten!). The next thing I did was meet with the photographer I was hoping to use, Just Love Me Photography and Design, to see which weekends they had open to shoot. Just as I expected, they had only 1 weekend open in September, and just a few left for October. It is INSANE how quickly this stuff books up! Finally, we went to look at possible reception venues in South Bend (where we will be having the wedding, more on that later). The 2 places we narrowed it down to had every weekend open in September and October 2012, sawwweeet. 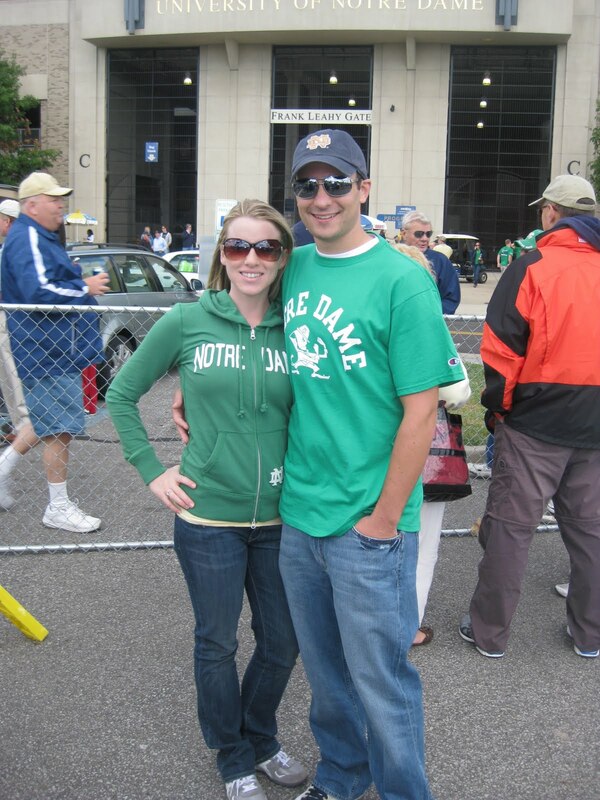 We did learn that we could NOT put the wedding on a Saturday when Notre Dame was at home, because, depending on how good they are next year, the hotels in the area can be up to $400 to $500 a night. That would have been awful for our out of town guests. September 1: Not an option. This date was eliminated because things are more expensive on holiday weekend. Also, we didn't want to assume that people would be wanting to spend a 3-day weekend traveling to our wedding rather than, say, soaking up the last bit of enjoyment @ their lake house or something. It is also the ND vs. Navy game in Ireland, which I'm sure lots of people at least want to watch. 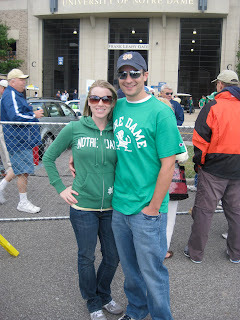 September 8: Not an option - the photographer had it open, but it's ND home game versus Purdue. September 15: Big option because ND is away, but the photographer didn't have it open. September 22: I originally LOVED this date. Perfect time weather-wise in my opinion. However, this was clearly out of the picture because it just so happens to be the date of the ND vs. Michigan game. September 29: ND's off week, but the photographer didn't have it open. Then we get into October. October 6: An option, the photographer also had it open. However, I started to think that there was a good chance that, if they play it, a lot of Justin's friends (and us too!) might want to go to the ND vs. Miami game @ Soldier Field. October 13: Not an option - ND is at home, and I don't like the number 13. I'm very superstitious, okay? October 20: Not an option - ND is at home. October 27: An option, ND is away and the photographer had it open, but I was worried it might be too cold at this time for any possible outdoor cocktail hour, etc. So after all of this and some talking, we had it narrowed down to September 15 and October 6. This meant, however, that we would not be able to use Just Love Me Photography and Design. With a heavy heart, I emailed Jessi, from Just Love Me, to break the news. Would you believe it!? 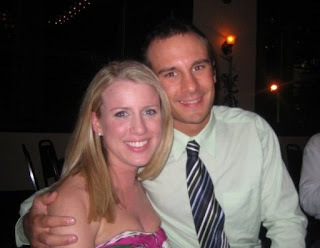 Her September 15 bride had just switched her date. With that, it seemed like it was just meant to be. Just 371 days to go! YAY! So glad you got your wedding date! How special!!!!! I never would have thought to arrange my wedding around a football schedule! Such hard work! Oh DUH! haha! I forgot about this post and you setting a date! sorry! !